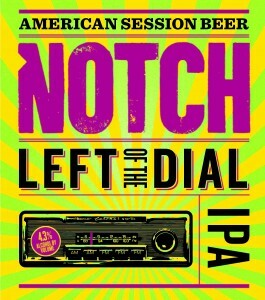 The first thing I'm going to say about Notch's new beer is this: you can, if you want, skip reading this post and just go straight to what Chris Lohring has to say about Left of The Dial IPA right here. Because he nails the whole "session IPA" discussion, and explains why he brewed this beer, and what it is and what it means, much better than I could. But...I'd like to pile on a bit. I'm totally jazzed that he's done this beer, that it's clearly a statement, that it's coming out the week of Session Beer Day, and that he's doing it with such a great name, the sloganish phrase he's been using for great tasting session beer for over a year now. The only downside is that I probably won't get any, because Notch is still very much an eastern Massachusetts phenomenon, and I'm not getting up there anymore. Why a session-strength IPA? Well, like I told a writer who was interviewing me yesterday (about beer selection strategies for beer bars' taps), IPA is not going away. Someone or other has been predicting the fade of IPA since the mid-1990s, and IPA just thumbs its nose and keeps growing. Betting against IPA, I told her, was like betting against vodka. Ain't happening. So roll with it. That's just what Chris is doing, because it's going to sell like mad. So, after all that, how does it taste? Like an IPA, but without any cloying sweetness and booze that fatigues and gets in the way of multiple pints and extended good times. Call it a Session IPA if you want, but to me it’s simply the IPA I’d like to drink, and I think Notch fans would like to drink. It may be the only time you see this beer, because it broke the bank, so I hope you enjoy! Yo, up in Boston! Drink my share! I'll drink your share Lew! Can't wait to get my hands on some.